I’d happily wager that New York is the most photographed city in the world and it’s easy to see why. Almost everywhere you look there’s a scene or building made famous by film makers or photographers over the years. Central Park, The Empire State Building, The Statue of Liberty, the Manhatten skyline, Brooklyn Bridge, Grand Central Terminal, Times Square. The list goes on. Famous landmarks which are even more impressive in real life. Yes, it’s been photographed a billion times over, yet it doesn’t take away any of the fun of trying to get your very own New York photo memory. We went in November, just before the famous Marcy’s Thanksgiving Parade. A good time of year to go, not least as it wasn’t too hot to lug camera gear around! If it’s your first time in The City That Never Sleeps, I’d recommend spending the first day or two on a city tour bus – great for getting to know where everything is – as well as the history lesson and local knowledge you’ll get from your guide. As the list of photo opportunities really is endless, I’ve selected just a few of my shots here. For more of my New York images, see my Flickr pages. Grand Central Terminal. A beautiful building crammed full of character and plenty of photo opportunities. Perhaps the most tried and tested of all is in the main concourse. Go with a friend for a fun slow release shot. Get them to stand dead still just in front of the main desk and clock in the centre, whilst you take the shot from the facing stairway. This image was taken on a 4 second shutter release, iso 800. If you have a wide angle lens, make sure you take it along. This was shot at 18mm which was as wide as I could go. A wider angle would capture the beautiful turquoise and golden ceiling. A good reason to return I think! Pershing Square. Just outside of Grand Central Terminal is this busy and colourful cafe / restaurant made famous by films such as Friends With Benefits. Take a tripod, focus on the cafe, set up a slow (ish) shutter speed and wait for the inevitable yellow cab to swarm past for a perfect New York memory. See www.pershingsquare.com. The Empire State Building. Whether you’re after views from, or views of this iconic 1930’s art deco building, it’s a must-do for any tourist in New York – photographer or not. If you’re after a view from the outside you’ll do well to have a wide angle lens at hand. In tightly packed streets, it’s hard to take a step back, and with only an 18mm at hand I wasn’t really able to cram the full scale of the tower into shot. For views from the top, I’d recommend heading up an hour or so before sunset, to guarantee some daylight, twilight, sunset and night time shots. You can buy sunrise and sunset passes, which allow you up twice in one day, but with so much else to see in this vast city, we really wanted to cram as much in as possible in one hit and so the late afternoon option worked best for us. See www.esbnyc.com. Remember to take a sturdy tripod if you have one. Yes, it can be a pain to lug around, but it’ll be worth it at the top, especially when the light starts to fade and you need as much support as you can get to keep your images clear and crisp. If you don’t have a tripod you should be able to find a small ledge to rest your camera on – provided you’re happy to wait your turn and wriggle your way in amongst the crowds. 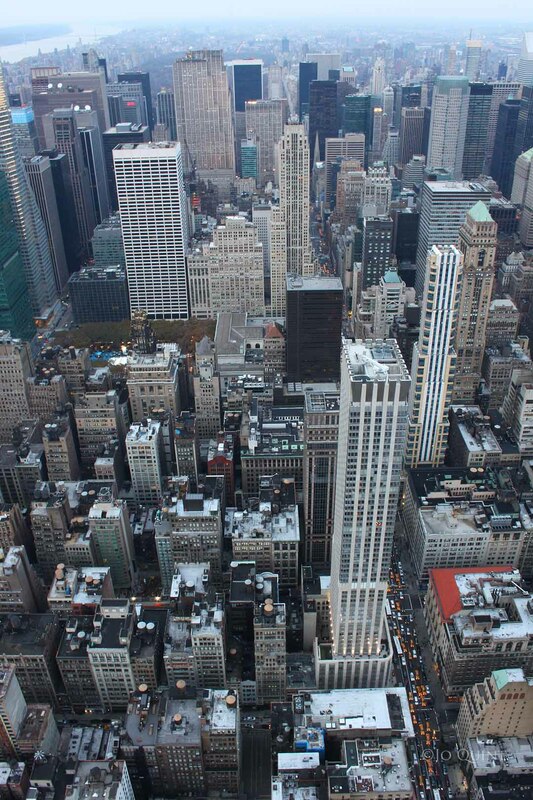 Of course, the one thing you can’t see from the Empire State Building – is the Empire State Building. As you can’t go to New York and not get photos of this most famous of all landmarks, you’ll need to head to (and up!) the Rockefeller Centre. Rockefeller Centre. We went up at night, which was great for seeing the city defined by twinkling lights from the buildings and matchbox cars. In one direction there’s a rectangular black hole, which in daylight would be the leafy green expanse of Central Park, whilst in the other direction there’s the Empire State Building and the Statue of Liberty. Yes, it’s perhaps the most photgraphed cityscape in the world, but there’s nothing more satisfying than having your own memory of this incredible city.